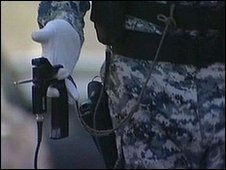 The UK government has announced a ban on the export to Iraq and Afghanistan of some so-called "bomb detectors". It follows an investigation by the BBC's Newsnight programme which found that one type of "detector" made by a British company cannot work. The Iraqi government has spent $85m on the ADE-651 and there are concerns that they have failed to stop bomb attacks that have killed hundreds of people. The ban on the ADE-651 and other similar devices starts next week. Sidney Alford, a leading explosives expert who advises all branches of the military, told Newsnight the sale of the ADE-651 was "absolutely immoral". "It could result in people being killed in the dozens, if not hundreds," he said. Questions were raised over the ADE-651, following three recent co-ordinated waves of bombings in Baghdad. Thirty-nine-year-old Aqeel Yousif Yaqoub was caught in a bomb at Iraq's Justice Ministry last October. The blast left him with injuries to his face and limbs, and damaged his take-away falafel store. "If they were effective," he asked, "how did the suicide car bomb reach this area?" 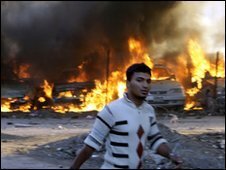 And an attack in December killed over 120 people, prompting Iraqis to ask how the bombs could have got through the city's security. Attention is increasingly focusing on the ADE-651, the hand-held detector now used at most checkpoints in Baghdad. Iraq has bought thousands of the detectors for a total of $85m (£52m). The device is sold by Jim McCormick, based at offices in rural Somerset, UK. Claims of such almost magical technical abilities would almost be comic, if the potential consequences were not so serious. Newsnight obtained a set of cards for the ADE-651 and took them to Cambridge University's Computer Laboratory where Dr Markus Kuhn dissected a card supposed to detect TNT. It contained nothing but the type of anti-theft tag used to prevent stealing in high street stores. Dr Kuhn said it was "impossible" that it could detect anything at all and that the card had "absolutely nothing to do with the detection of TNT". "There is nothing to program in these cards. There is no memory. There is no microcontroller. There is no way any form of information can be stored," he added. The tags which are supposed to be the heart of such an expensive system cost around two to three pence. "These are the cheapest bit of electronics that you can get that look vaguely electronic and are sufficiently flat to fit inside a card," Dr Kuhn told Newsnight. The ADE-651 has been sold to a range of Middle Eastern countries and as far afield as Bangkok for eye-watering prices. Iraq paid around $40,000 for each device. No Western government uses them. The promotional material for the ADE-651 claims it is powered only by the user's static electricity. Iraqis themselves are sceptical about the device. "They don't work properly," Umm Muhammad, a retired schoolteacher said. "Sometimes when I drive through checkpoints, the device moves simply because I have medications in my handbag. Sometimes it doesn't - even when I have the same handbag." The BBC has learned that following the December bombings, the Iraqi Prime Minister Nouri al-Maliki has ordered an investigation into the bomb detectors, expected to report any day now. Concern over the use of dowsing rods to detect bombs was first raised by American sceptic, James Randi. 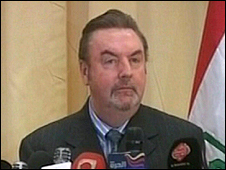 Mr Randi has confirmed to the BBC that he is still offering Mr McCormick $1m if he can prove that the ADE-651 works. In 1995, the Sandia national labs and the FBI raised the alarm over a dowsing rod device called the Quadro Tracker which they described as "a fraud" and the FBI warned: "All agencies should immediately cease using the device." In 1999, the FBI put out another alert: "Warning. Do not use bogus explosives detection devices." In 2002, a test by Sandia labs in the US found that a similar dowsing rod device, called the Mole detector, did not work and performed "no better than a random selection process". They concluded that it did not work and that it looked "nearly identical" to the Quadro Tracker. Last month, a senior Iraqi officer involved in bomb-prevention defended the ADE-651. "Whether it's magic or scientific, what I care about is it detects bombs," he said. And policemen manning checkpoints in Baghdad have told the BBC that you need to be relaxed to use the ADE-651 and that it does not work properly if the user is stressed or has a high heart rate. In other words, the message which has got through to the frontlines is - if it does not work, blame the operator not the device. Mr McCormick declined our request to interview him for this report, but late last year he told the BBC that he has been selling products like the ADE-651 for over a decade and that he has sold 6,000 of them to around 20 countries. They are in use everywhere from Thailand to Pakistan and Lebanon. "For a British company to be selling a piece of technology that is useless when it's meant to be saving lives is abhorrent," Lou McGrath, chief executive of the charity, Mines Advisory Group, told Newsnight. Watch Caroline Hawley's full report on Newsnight on Friday 22 January 2010 at 10.30pm then afterwards on the BBC iPlayer and Newsnight website.